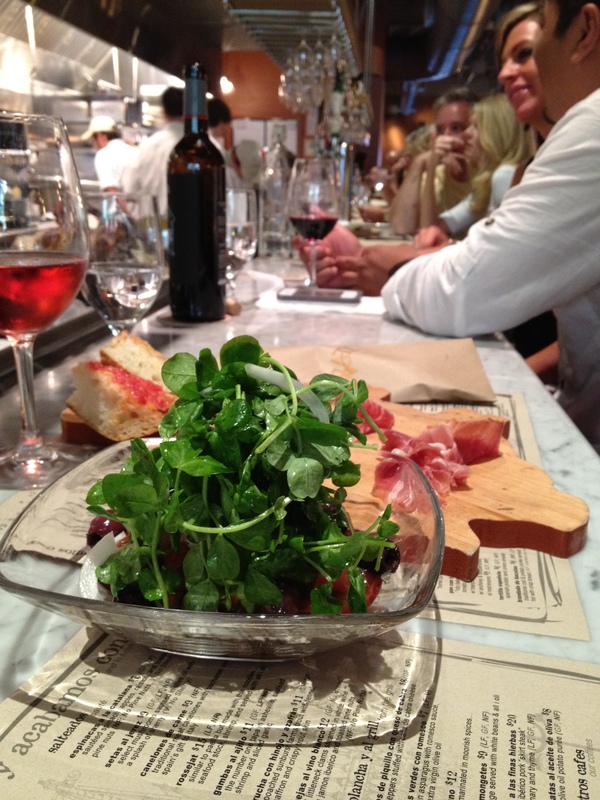 Curate: Spanish Flair in Downtown Asheville | Oh, the Places We See . . .
← Asheville NC: Shopping’s Unique! Now that I’ve seen the website for Curate and read about this rave-about place for fine dining, I don’t know how I could have almost walked past without even knowing about this unique new restaurant. It was all quite accidental. My husband and I were meandering down Biltmore Avenue (Asheville, NC) in search of art galleries when we spied a pig in a window! And then an interesting name — Curate — with the pronunciation prominently displayed! I said, Let’s go in there for just a minute – OK? – to see if we want to eat here tonight. 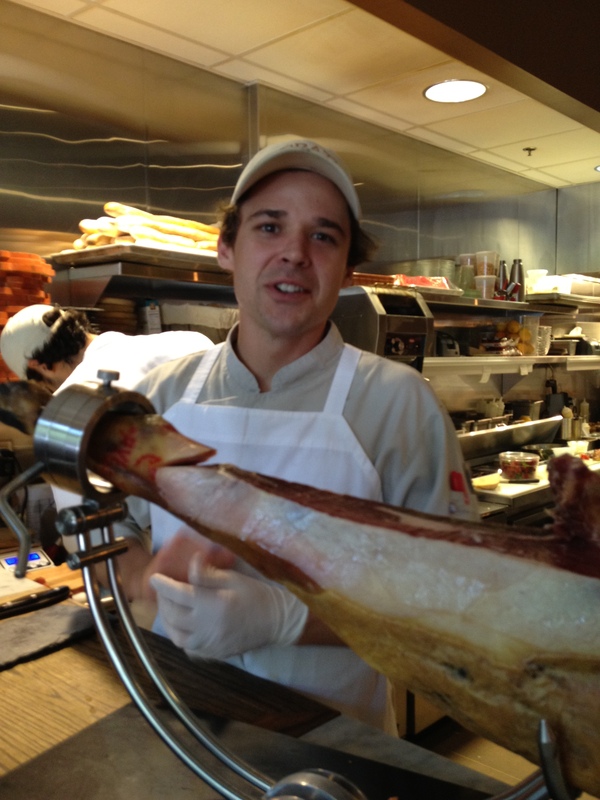 And that’s when we saw Tyler (immediately, he introduced himself) carving Jamon Iberico! Tyler began telling us about this delicacy — acorn fattened Spanish ham — and other menu items we could order from the restaurant he so obviously loves! He said Chef Katie Button (Cornell graduate, master’s from L’Ecole Centrale in Paris) abandoned her major (chemical and biomolecular engineering), followed her passion for cooking, and eventually became a service manager at Ferran Adria’s famous restaurant in Spain — El Bulli! With the support of her parents and fiancé, she opened this now award-winning restaurant in Asheville — naming it Curate, meaning “cure yourself.” You can come here and allow others to take care of you so that you, in turn, feel cared for. And it works. On all levels. We immediately asked for a reservation only to be told that they were booked nights in advance. 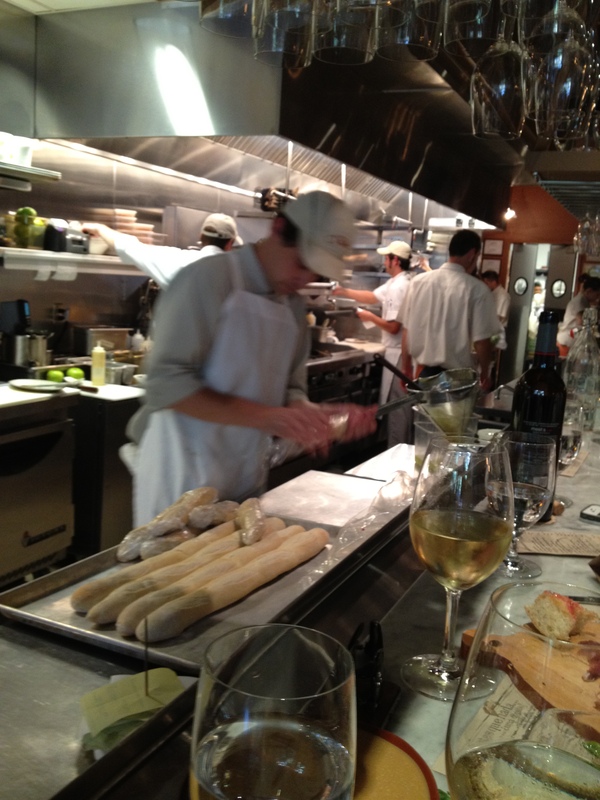 We could take a chance at getting seated at the bar — which is where we landed that very night — a front row seat watching masterful preparations in the open kitchen and listening to the banter between servers and customers! Open kitchen at Curate as seen from the bar. It’s a tapas bar — you order and share small plates. 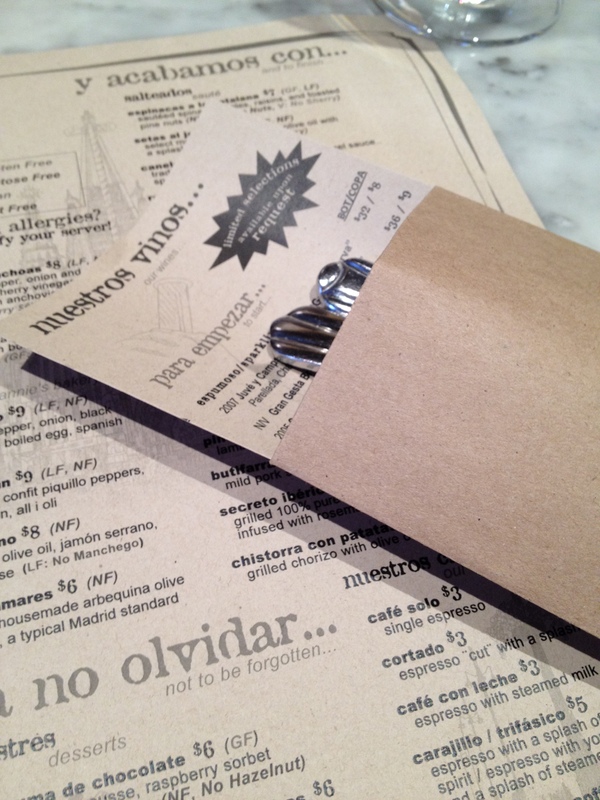 Brown paper menus greet you, accompanied by a sleeve of silverware and list of nuestros vinos (their selected Spanish wines). We made friends with people on either side. The couple to our right were sharing Ensalada de Tomate Yatun — a Kumato tomato salad with preserved Spanish Bonito del Norte tuna and black olives, topped with greens from Jolley Farms! Wow! 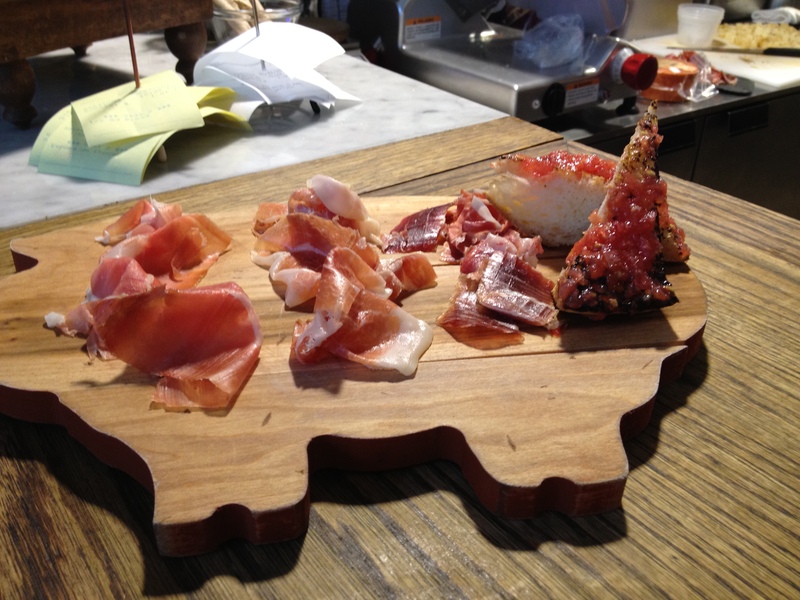 Mary Hill, to our left, suggested we start with what we came for: the Tabla de Jamon — a selection of three cured hams. A Curate customer who knew what to order! 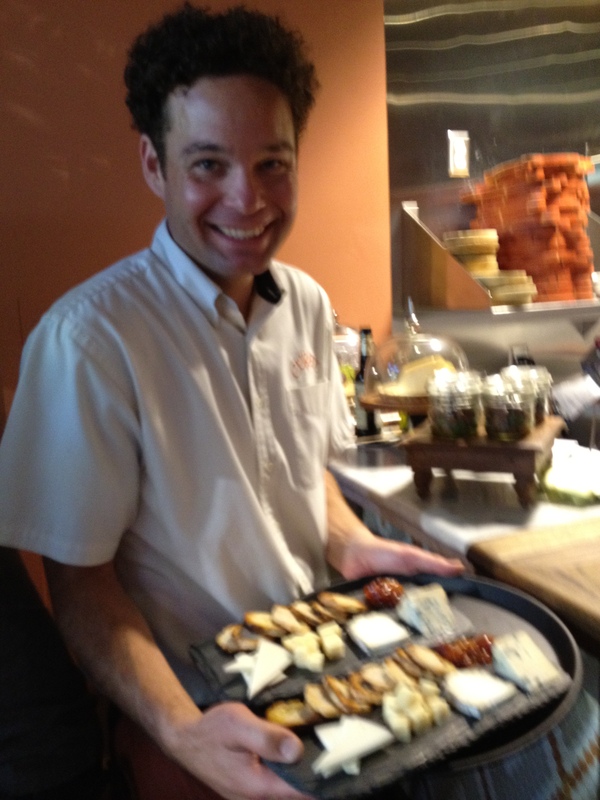 And yes, we could tell the difference once we tasted each one that this affable server, Daniel, presented. 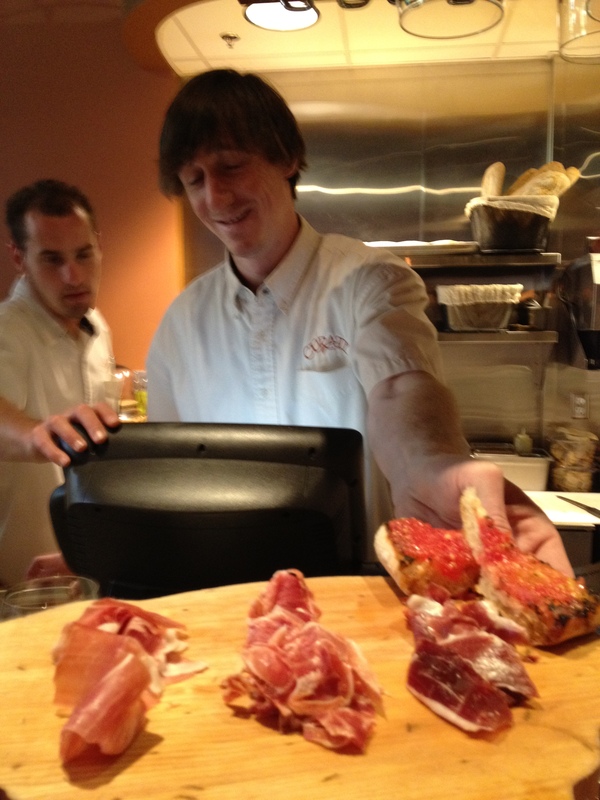 From left to right: Jamon Serrano Fermin (dry cured Spanish ham); Jamon Iberico Fermin (cured ham from black-footed Iberico pigs); and the one that brought us in as Tyler was shaving it at the counter — Jamon Iberico de Bellota (the top shoulder cut from acorn fattened free-range pigs). Daniel knows ham – and how to talk to curious customers! While we waited for our other plates, I snapped a picture of Tabla Dequesos (Spanish cheeses) ready to serve. And that’s when I sighted my favorite “junker,” Mike Wolfe of American Pickers, one of the shows I watch on the History Channel! It was all I could do to leave him alone to enjoy his dinner at Curate without being hounded by a gushy fan! I resorted to snapping this picture from across the room. 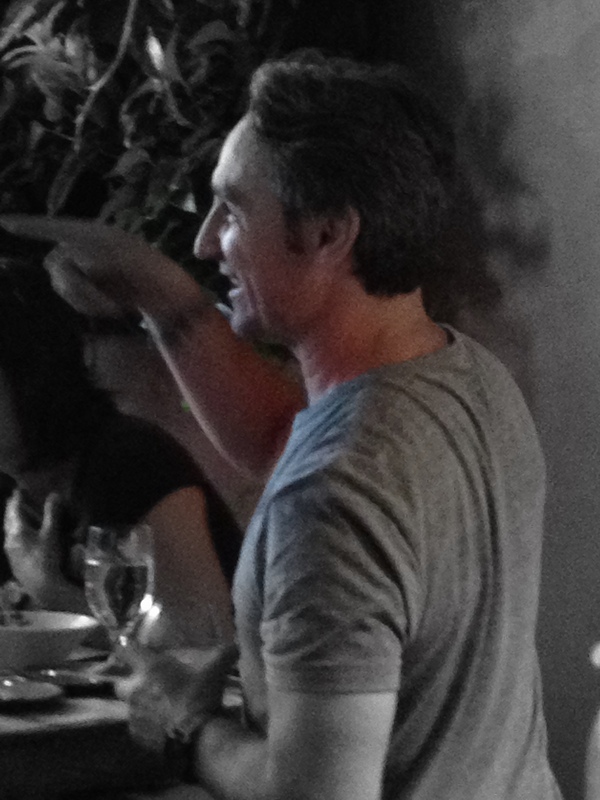 Celebrity Sighting: Mike Wolfe from American Pickers! He’s not the only famous person who’s visited Curate. You can read about Anthony Bourdain’s fall 2011 visit reported by the Asheville Citizen Times here. Meanwhile, our small plates arrived, and I was able to focus on presentation AND interesting taste! 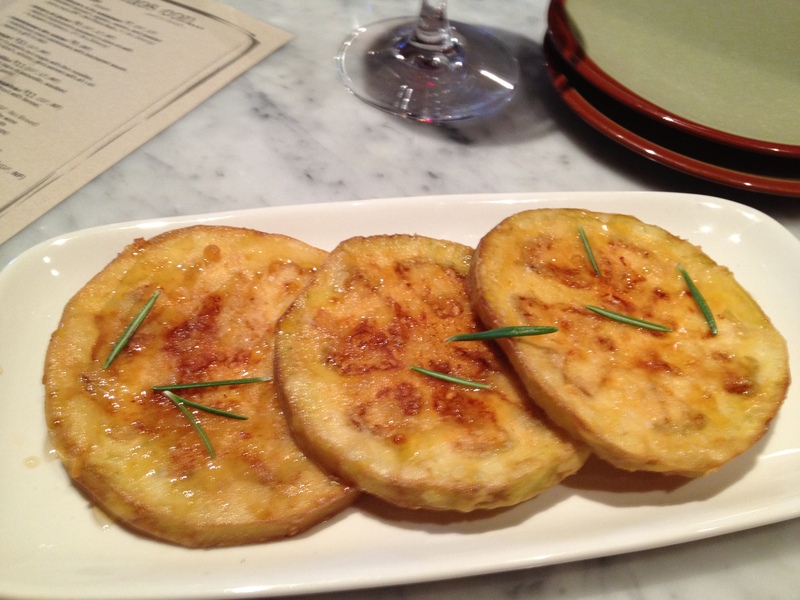 First, Berenjenas la Taberna (fried eggplant drizzled in Wild Mountain Apiaries honey) — fork tender with just a hint of sweetness . . .
Fried eggplant drizzled in Wild Mountain Apiaries honey! 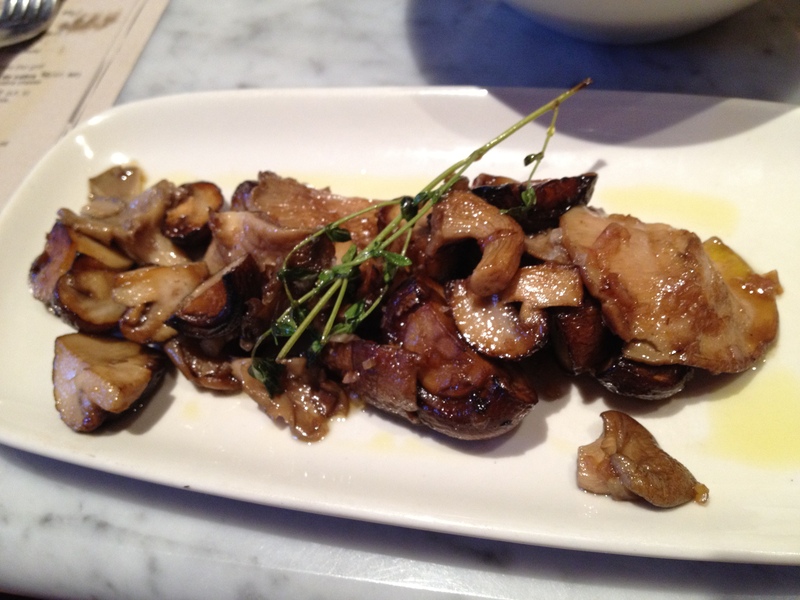 followed by Setas al Jerez (mushrooms sauteed in olive oil with a hint of sherry) . . . Selected mushrooms sauteed in olive oil! and finally, according to the menu, the “number one tapa in Asheville”: Gambas al Ajillo (sauteed shrimp and sliced garlic)! 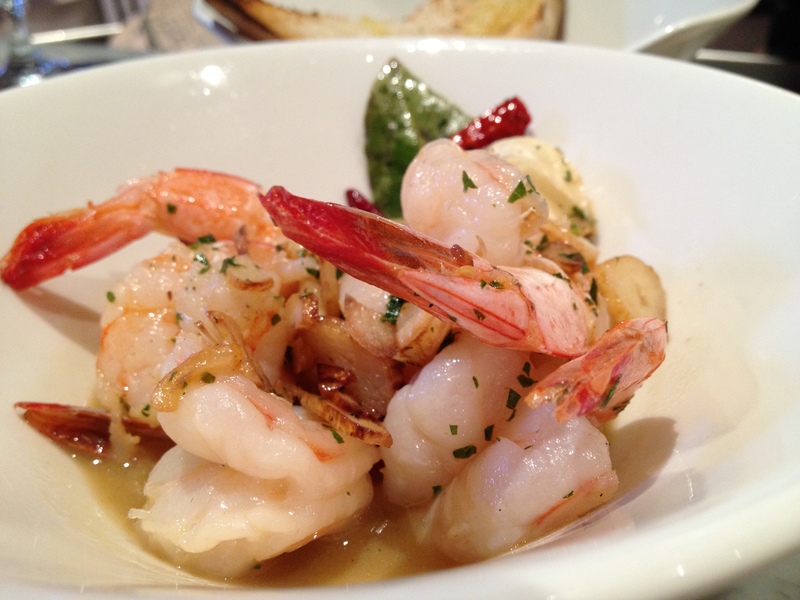 Sauteed shrimp and sliced garlic! We had no room for Esparragos Blancos (white asparagus tossed in a lemon tarragon vinaigrette), but watching the preparation of this dish qualified as entertainment — several steps with a voila! ending. 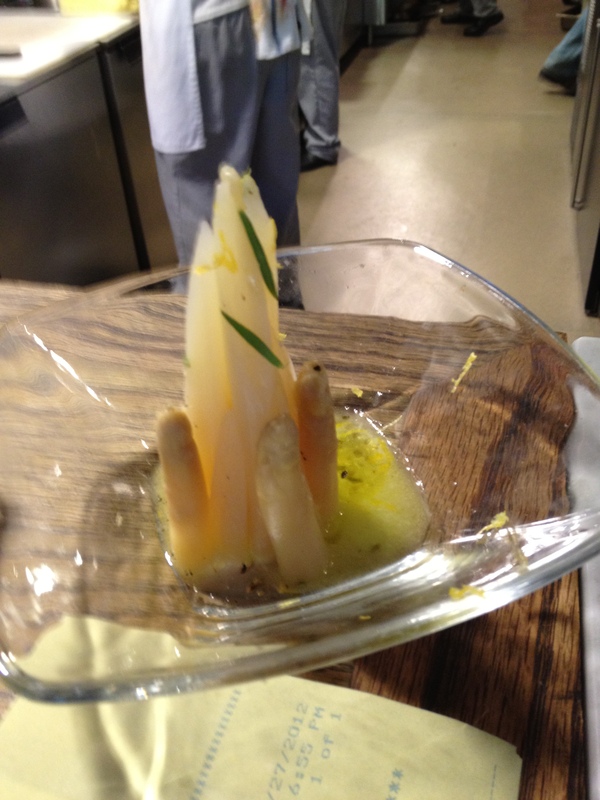 Artful presentation: white asparagus tossed in lemon tarragon vinaigrette! And, then . . . tah-dah! 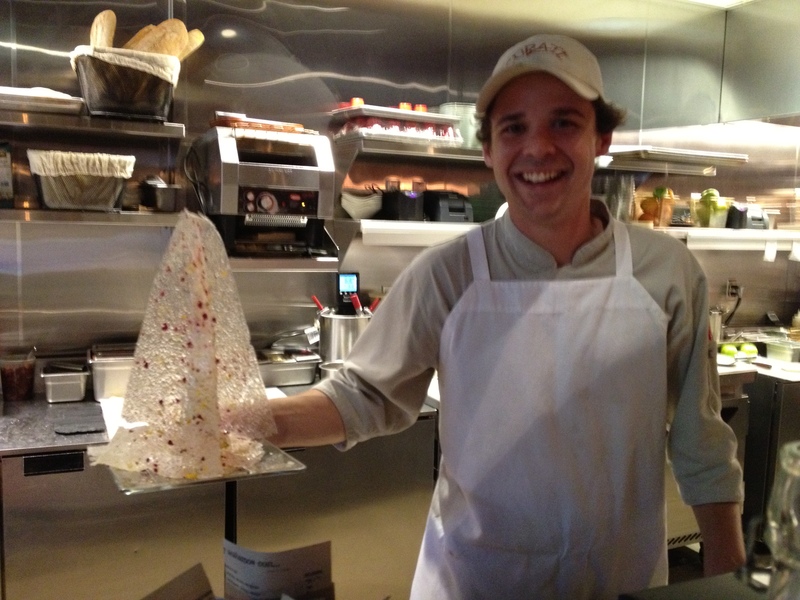 Tyler surprised us by showing off one of their most intensely prepared desserts — an almost-transparent Buenuelo to top anything we’d ever seen! By now, we were friends, you know, and he wanted to show us everything in this classy eatery! 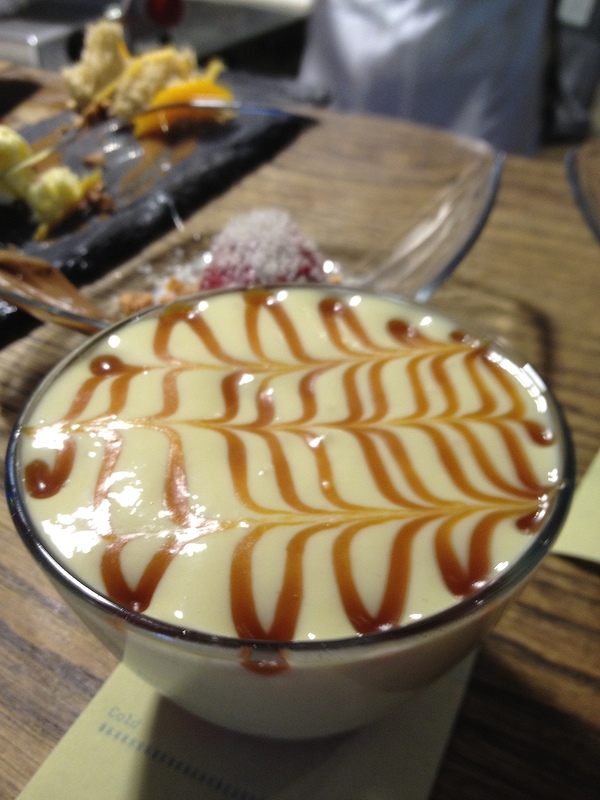 We’re definitely not among the first to be enamoured of Curate‘s cuisine and service. This relatively new-to-Asheville restaurant has won the Best of WNC Top Chef Award and mention in Southern Living magazine as a go-to destination! 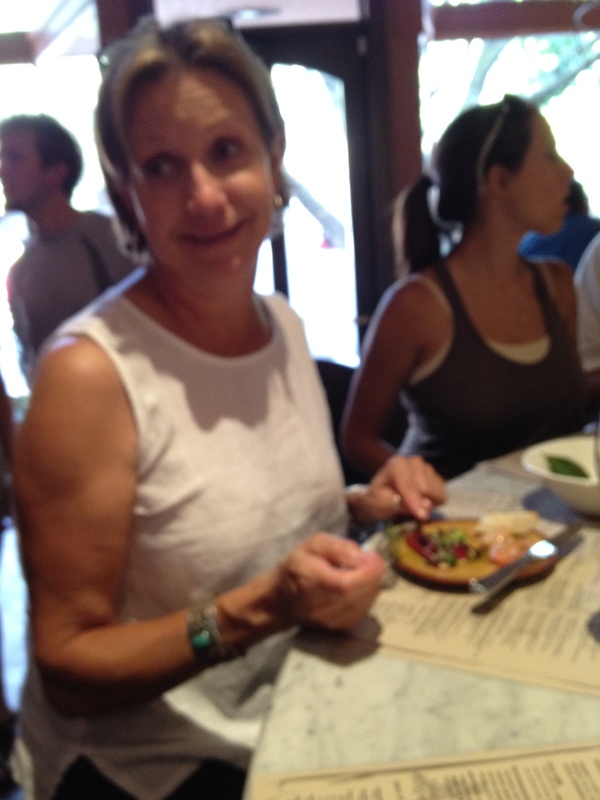 But for BIG TASTE on small plates, ya gotta go there yourself! 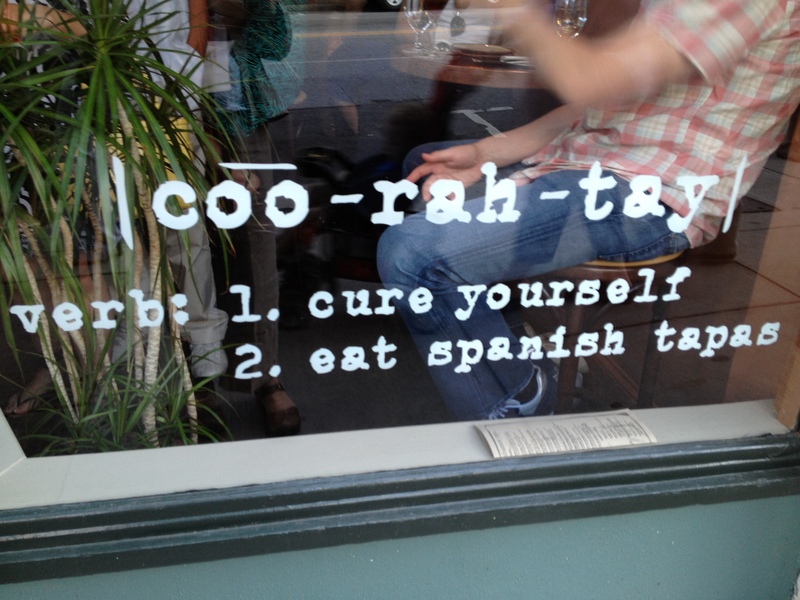 Eating Spanish tapas just may cure yourself! 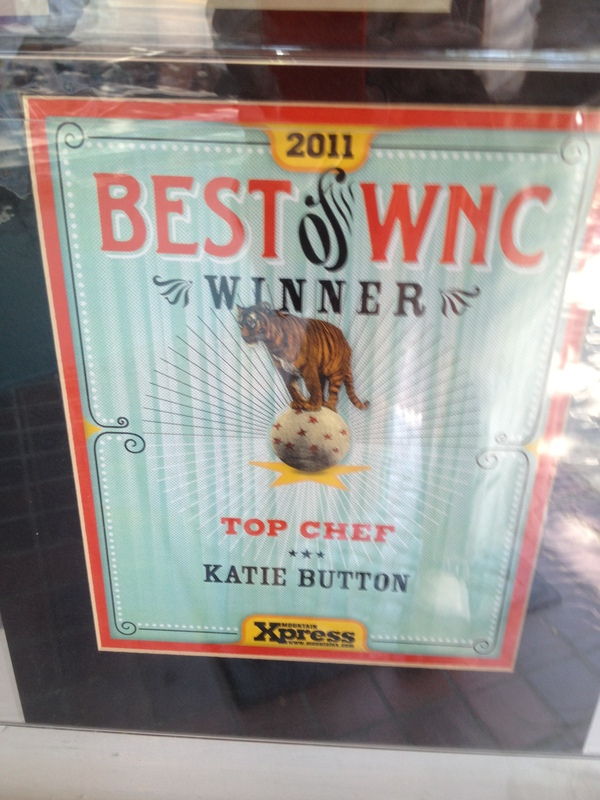 This entry was posted in Restaurant and tagged Asheville, dessert, pork, restaurant, seafood, top chefs. Bookmark the permalink. Wow, Rusha! I can’t wait to go there! Forget Southern Living — your enthusiasm is testimony enough for me! hmmm. Thanks for bringing back the memories. Ellen Bebb, a couple of non-Knoxville friends and I were in Asheville last November and experienced this wonderful restaurant. 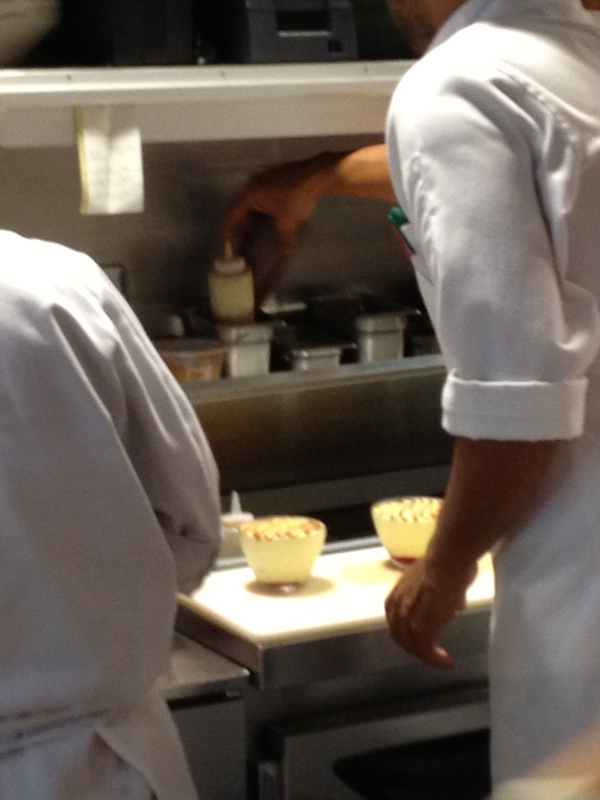 After seeing what the cooks were preparing, we’re going to have to go back for more! Glad you agree that it is good eating, but also beautiful preparation!